In today’s digital world, human connections have become impersonal and less meaningful. Everything is done by means of digital and social technology and there are no physical traces of much anymore. Happy birthdays have become Facebook wall posts, texts, or e-greetings. All because it’s easy, fast, and convenient. With Caregatto, you can now send a birthday card from the comfort of your home! In just a few clicks, you skip the drive to the store to pick up a greeting card and waiting in long lines at the post office to mail the card. 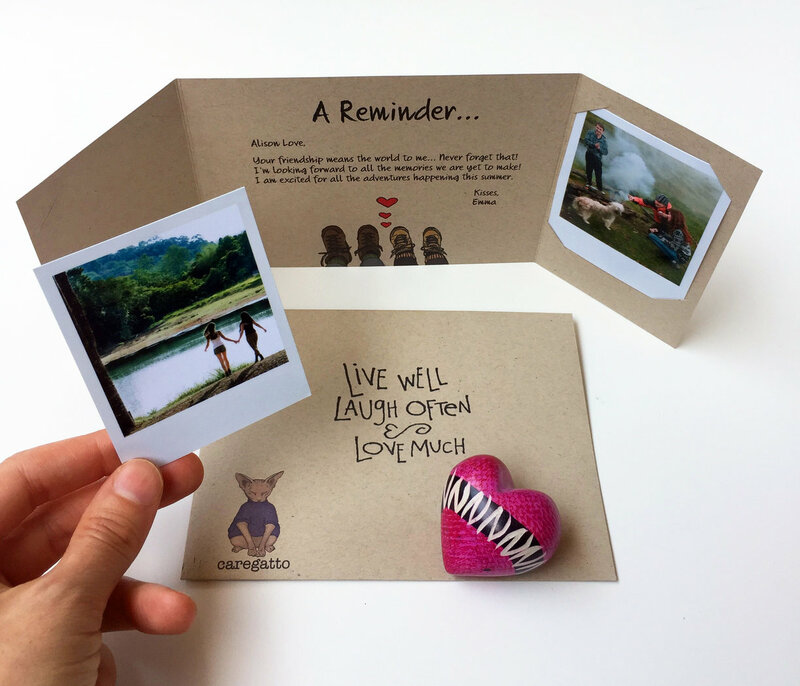 With Caregatto you get to send a unique artisan birthday card that comes with 2 real photos inserted inside the card! It’s like a gift in an envelope. It’s more exciting and personal than any card you can purchase at the store and the inserted photos will make sure the memories will outlive the card. Want to personalize your card one step further? You can choose to send your card scented. This is done by using only pure essential oils, not synthetic scents. There are scents for everyone: floral, woodsy, masculine. And since scents are intimately connected to emotions, and pleasant scents are shown to have an uplifting impact on one’s mood and a positive impact on health – the birthday person gets to experience it all. Caregatto offers a collection of unique zodiac birthday cards that would give our friends who are into astrology a big smile. It combines art with astrology, and the result is a personal illustration that is unique to each sign and embodies its characteristics. Combined with your photos and personal message, it is sure to make the recipient feel special and loved. Each design is also available in a non-photo version if you want to send a birthday card but don’t necessarily want to include any photos. In addition to having their birthday collection, their personalized cards can be used for any and all occasions. From Happy Anniversary to Happy Birthday and everything in-between. 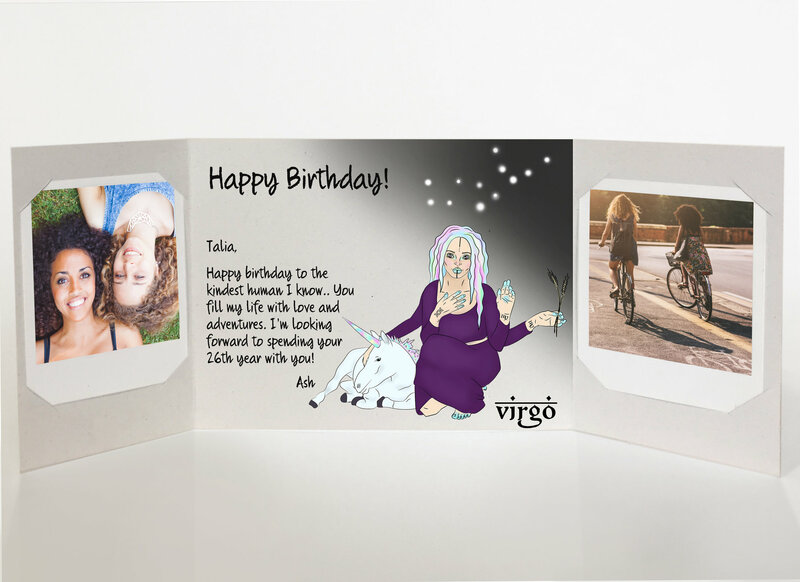 The personalized collection allows the sender to get creative and come up with their own header, such as using the nickname of a loved one in the header, so the card is made just for that special person. They have designs for all occasions, plenty of illustrations for love, friendship, and more. Caregatto also offers a collection of unique small gifts to accompany their artisan cards for a complete gift giving experience. They believe in social consciousness, minimalism and preserving our ecosystem and that is visible through their gifts. They work with many verified fair trade providers, and offer a unique collection of interesting little hand-made gifts from around the world. For example, their soapstone hearts are hand carved and painted in Kenya by a group of artists that live in the rural village of Tabaka, Kenya – the heart of soapstone crafts. The organization in charge assures that these artisans are paid a fair price for their work. These cute hearts make a perfect gift for anyone we hold near and dear to our heart.